Emily Stone was just months away from completing her Bachelor of Science in Nursing degree at National University, looking forward to helping others, when she found the tables drastically turned. She was no longer just a nurse in training, but also a patient diagnosed with acute lymphoblastic leukemia. Her doctors told her she would require an immediate course of chemotherapy treatments and numerous hospital stays over the coming months. 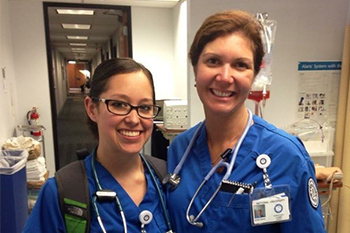 Emily Stone (right) who earned her nursing degree while undergoing cancer treatments, will participate in National University’s 2016 Commencement. Emily’s determination, paired with the exceptional assistance and guidance from the National University School of Health and Human Services, led not only to a successful fight against cancer, but also to a successful completion of the competitive bachelor of nursing program. She is participating in National University’s June 2016 Commencement, and is now on her way toward a new career, while exploring the idea of specializing in pediatric cancer patients. Her experience underscores her singular determination to be an exceptional student, as well as National University’s commitment to creating an exceptional student experience that takes into account the unique needs of each student. In Emily’s case, National University made arrangements for her to finish her coursework and complete her clinical hours, from her room at UC San Diego’s Thornton Hospital. Emily has always had an interest in the medical field, but she put her own professional pursuits on hold after earning a bachelor’s degree in French Studies with concentration in Environmental Sciences from Smith College in Massachusetts. She got married to a serviceman and started having a family before settling in San Diego. National University, with its strong background in working with military family members and an accelerated Bachelor of Science in Nursing program, was a natural fit. Emily enrolled in the program in 2013. After being diagnosed with cancer in June of 2015, Emily’s chemotherapy treatments and hospital stays made it difficult to complete her classes and schedule the required clinical hours required to become a registered nurse in California. That’s when Dr. Richard Guertin, Chair of the Nursing Department at the National University School of Health and Human Services and a former Navy hospital corpsman, stepped in. Dr. Guertin helped to set up a virtual National University classroom in Emily’s hospital room. He scheduled virtual clinical hours, and worked with ATI Nursing Education to schedule virtual clinical nursing hours at the same time. Though the BSN nursing program requires students to follow a particular sequence of classes, National University’s one-class-per-month format and multiple cohort starts each year made it possible for Emily to complete the remaining classes she had in a timely manner once she felt better. In fact, Emily was among a group of National University students who were recently chosen to ask a question to visiting speaker, Oprah Winfrey. She is looking forward to working as a registered nurse, and she believes that her experience, despite its many challenges, has given her both the strength and empathy to understand what it means be a patient – and an even better nurse.